Is your pet, ANXIOUS, NERVOUS or AGGRESSIVE? Does your pet have a CHRONIC ILLNESS? Have you considered REIKI ENERGY HEALING? CHECK OUT OUR REIKI SEGMENT ON HIP NJ! Reiki is not just a healing practice for humans. We believe animals are emotionally responsive, spiritual beings, just as we are, thereby making them perfect candidates to receive and benefit from the positive results of Reiki. Reiki (pronounced Ray-Kee) translates to “universal life force energy” and is an amazing healing methodology discovered in Japan. Offered as an alternative healing modality, Reiki can be found today in many hospitals, nursing homes and private practice. While it has been mainly used for healing people, in recent years we’ve realized how beneficial this healing system can be for animals. As living beings, a life force of energy flows through us via pathways called meridians and energy centers called chakras. The life force is also present as an energy field flowing around us, which has been given the term Aura. When our chakras, meridians and auras are operating at maximum capacity, we are in perfect physical, emotional and spiritual harmony. Reiki should be given in a calm, quiet and peaceful environment. The practitioner can either lay their hands upon the energy centers (chakras) of your pet, or if the animal is not amenable to touch, the Reiki can be “sent” to them from a safe distance. Reiki energy is harnessed from the Universe by the Reiki Practitioner’s intentions to do so. She/he is not a healer, but rather a conduit for bringing healing about. It is the being receiving the healing, in this case your pet, that is actually doing the healing themselves. The practitioner is merely a facilitator to aid the client along his/her path to healing. 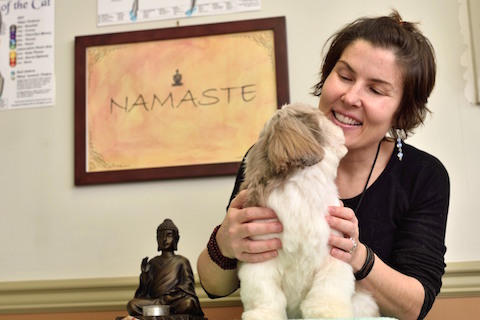 Erica Salvemini, owner of Just 4 Paws Pet Spa, is a certified Reiki Master Practitioner attaining certifications in Levels I, II, and Master Teacher training. HOW CAN REIKI HELP YOUR PET? Reiki is beneficial on many levels – emotional, physical and spiritual. It is a powerful tool for healing traumas due to neglect, abuse, fear and trust issues, reaching even the most damaged of spirits. On a physical level, it’s the Life Force Energy that nourishes the organs and cells of a living being. It is this energy that keeps your pet functioning at optimal capacity and supports their body’s vital functions. When that flow of energy is disrupted, it can cause diminished performance among vital organs and ultimately impair the function of the physical body. This can lead to physical and even emotional imbalance in your pet, which results in stress, anxiety and even depression. Reiki energy works toward balancing the entire chakra system of the body to bring harmony to the spiritual, physical and emotional being of your pet. Reiki can also help your beloved pet as it nears their time of passing by bringing peace and comfort to you and your pet during this difficult time. Reiki seems to help their soul and spirit relax so they are not afraid to pass over. Or, your pet may be struggling to surrender because they want to stay on as part of our lives. Sometimes they stay longer for us, in spite of their suffering. Reiki will help your beloved pet release their grief so they can gently and peacefully move on. WHY WOULD REIKI BE IDEAL FOR HEALING YOUR PET? Reiki is gentle, painless, non-invasive, and stress-free, yet it yields powerful results. Animals, not unlike children, respond quickly and intuitively to Reiki’s powerful healing. It goes to work on emotional, behavioral, spiritual and physical illness and injury. Reiki can be used as a complementary therapy for animals, and on occasion be utilized to avoid harsh or invasive treatments. However, we never suggest Reiki as a substitute for required veterinary care. HOW OFTEN SHOULD YOUR PET RECEIVE REIKI? Please keep in mind that Reiki, like many other alternative healing modalities, works best with regular treatments. It has a progressive effect, much like going to the gym and working out your muscles. Think of it this way, you won’t get “fit” in one single session at the gym. This effort takes time, commitment and consistency. It is recommended that your pet receive a minimum of 1-2 reiki sessions per week for one to two consecutive months. This should be followed up with a regular maintenance schedule of 1-2 sessions per month. These recommendations should be modified based on your pet’s specific emotional, spiritual and physical healing needs.